“Legends on the Line” is a blog series that stretches from National Lineman Appreciation Day (April 18) to Lineworker Appreciation Day (July 10) in honor of the brave linemen and linewomen who climb above and beyond to power our world. This blog post was drafted in partnership with Basin Electric Power Cooperative. Linemen face extreme heights, long hours, treacherous weather and miles of live wire – all for the sake of powering our world. They’re truly vital to keeping our lights on, and they need the right gear for the job. 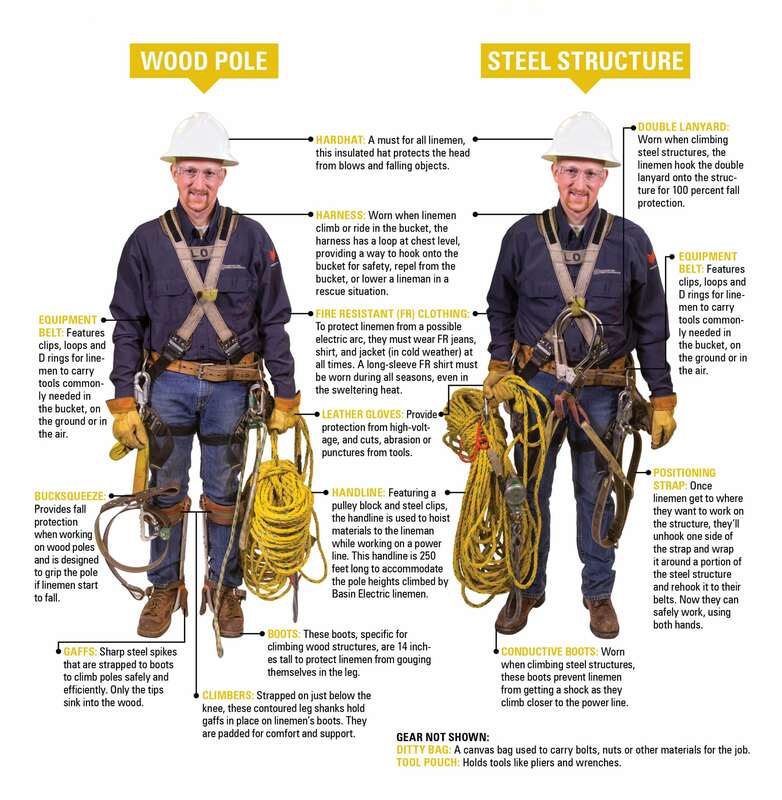 Typically, a lineman can carry as much as 50 pounds of bulky gear, spending most of the day working on wood or steel structures up to 300 feet tall. These structures often range from 115 kilo-volt (kV) lines to 345-kV lines, so having the right materials for a specific structure is essential. Boots: These boots, specific for climbing wood structures, are 14 inches tall to protect linemen from gouging themselves in the leg. Bucksqueeze: Provides fall protection when working on wood poles, and is designed to grip the pole if linemen start to fall. Climbers: Strapped on just below the knee, these contoured leg shanks hold gaffs in place on linemen’s boots. They are padded for comfort and support. Equipment belt: Features clips, loops and D-rings for linemen to carry tools commonly needed in the bucket, on the ground or in the air. Fire-resistant (FR) clothing: To protect linemen from a possible electric arc, they must wear FR jeans, shirt and a jacket (in cold weather) at all times. A long-sleeve FR shirt must be worn during all seasons, even in the sweltering heat. Gaffs: Sharp steel spikes strapped to boots to climb poles safely and efficiently. Only the tips sink into the wood. Handline: Featuring a pulley block and steel clips, the handline is used to hoist materials to the lineman while working on a power line. This handline is 250 feet long to accommodate the pole heights climbed by many linemen. Hardhat: A must for all linemen, this insulated hat protects the head from blows and falling objects. Harness: Worn when linemen climb or ride in the bucket, the harness has a loop at chest level, providing a way to hook onto the bucket for safety, repel from the bucket, or lower a lineman in a rescue situation. 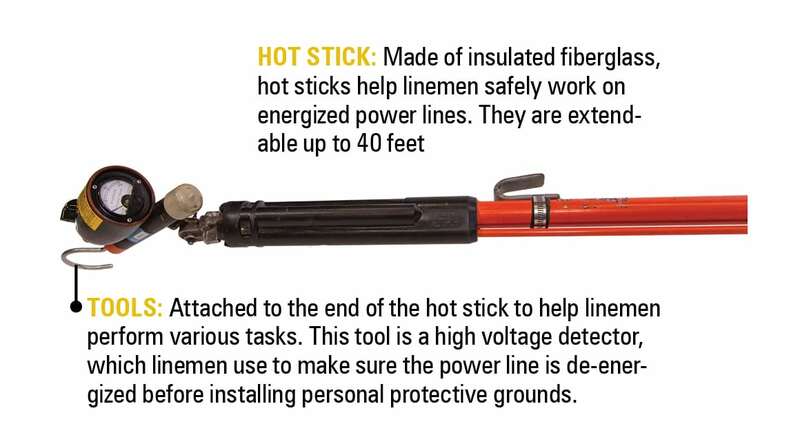 Hot stick: Made of insulated fiberglass, hot sticks help linemen safely work on energized power lines. They are extendable up to 40 feet. Leather gloves: Provide protection from high voltage, as well as cuts, abrasions or punctures from tools. Conductive boots: Worn when climbing steel structures, these boots prevent linemen from getting a shock as they climb closer to the power line. 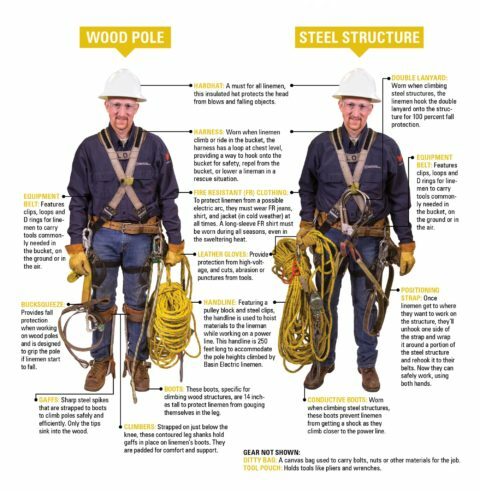 Double lanyard: Worn when climbing steel structures, the linemen hook the double lanyard onto the structure for 100 percent fall protection. Positioning strap: Once linemen get to where they want to work on the structure, they’ll unhook one side of the strap and wrap it around a portion of the steel structure and re-hook it to their belts. Now they can safely work, using both hands. Through our Legends on the Line campaign, Border States also helps support National Sisterhood United for Journeymen Linemen, an organization that’s been helping the families of fallen lineworkers since 2012.